Very happy with this comforter set. The fill is thinner, not a thick comforter. Better for hot climates. The tan is darker on the pictured side then the reverse. Reverse with strips is slightly lighter tan. Great buy! The Madison Park Georgia Comforter Set is perfect for those seeking a traditional and comfortable atmosphere. 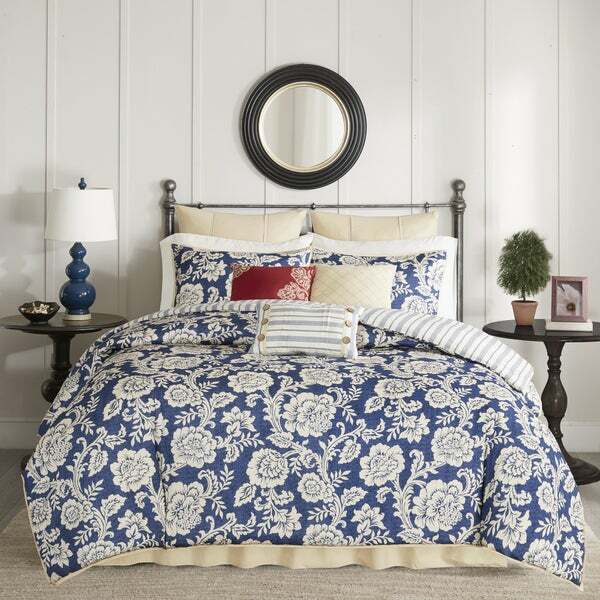 The comforter features a timeless floral motif in a classic red, khaki and navy color scheme. The comforter reverses to reveal a cozy khaki and blue striped pattern on an ivory ground. Three decorative pillows use embroidery and fabric manipulation to highlight the same elements seen on the comforter. Three decorative pillows, two shams, two euro shams, and one bedskirt are included with the comforter to complete this set. I was ready for a change of color in my bedroom. I wanted a dark blue comforter for "tranquility". My decorating style is country, but not to the extreme; "Simply Country". After reading the previous reviews I decided to give this comforter set a try and I'm so glad I did. It was exactly what I was looking for and it's not too "busy", so I can add yellows, reds and/or greens in my decorating accessories. Also, I sleep very comfortable under the comforter. I love this comforter set! It's well made and the colors are beautiful! It is warm without being too bulky. The throw pillows are a great bonus. For the price, you can't beat it! I love this comforter set! My husband says it's too fluffy, but I love that about it! The only thing I don't like is that one of the accent pillows looks cheap and tacky, but other than that, no issues! You won't be disappointed in this comforter set. It's great quality. The pillows are so nice. The comforter is warm. The colors are perfect. Definitely a good value. I expected better for this price. The color and design is as pictured, however it's was very average set, and actually ran a little small (I purchased King). The stitching wasn't straight on the pillows and shams, so I am returning it. Rather disappointing for $***. I have been looking for a new comforter for quite some time and I fell in love with this one the first time I saw it. The colors and pattern are lovely. I haven't washed it yet, but so far it is very fluffy and warm. One suggestion I would make is that the bed skirt should be made from the ticking stripe fabric on the reverse of the comforter rather than the "vanilla" fabric that was used. Very pleased with my purchase. Love it! The colors are bright and gorgeous. Very comfortable. Not too heavy but not too light either. Brightens up my bedroom! Very well made. Great for a farmhouse/country look. Colors are as shown. This set is beyond expectation. Comforter is soft and not shiney. All items go together perfectly. Looks like I had a decorator come to my house. Thanks so much and price was unbelievable..
Love this set! Purchased Navy Blue - after an extensive search. Full/queen set could be a little larger. Not a deal breaker. I have a queen sleigh bed so the fit is perfect. Much nicer than pictured. Best part... has the spouse seal of approval. was not the color we were after so it was a return however i will say overstock.com is wonderful to order from, they are awesome keeping you informed of items ordered and returning item was a breeze. We were very impressed with overstock.com. Beautiful pattern! Excellent quality material. Color is true to color on web site and looks better in person. Material holds up to wear and tear. Would recommend and buy again. This set looks as good in person as in the picture. I am happy to say it has held up nicely after 6 months of use and regular washes. Very happy with this purchase! Great quality and very pretty!!! We love it!!! This is a beautiful comforter set. It is has deep vibrant colors that are true to what is picture. The stitching is near and it is very well sewn. I have black furniture and it looks nice and well put together. Just Love it! And I was looking for a comforter set, and not a duvet cover set this time! price was right and looking for dark blue floral set. Material Details:Comforter/Sham: 100% cotton twill, printed, cotton/polyester, printed reverse, 270g/m2 polyester filling Bedskirt: cotton twill solid drop, polyester fabric platform Euro Sham: cotton twill Pillow: cotton/poly and cotton twill cover, polyester filling. Unfortunately we don't have the thread count. "Is this machine washable "
It can be machine washed.